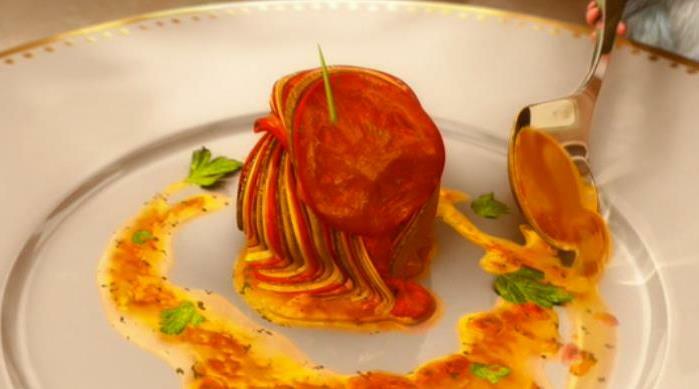 Before we watched Pixar’s Ratatouille, we’d have probably slapped you for suggesting that we’d ever go all mouth-watery over a meal prepared for us by a rat. But the Oscar-winning film managed to not only entertain the hell out of us, it also gave us a dish so delicious-looking that we’ve craved it ever since. And yes it was made by a rat. In order for us to attempt to recreate this magic moment, we enlisted the help of proper human Dave Watts, head chef at The Cotswold House Hotel, who gave us his expert take on ratatouille. Place the pan onto a medium heat; add the oil, diced onions and salt. Cover with a lid and cook for 5 minutes until starting to soften. Add the sliced garlic and cook for a further 8-10 minutes on a low heat, still covered with the lid. When the onions and garlic are completely soft add the puree, turn the heat to medium and cook for 1 minute. Add the quartered tomatoes, stir and cover, return to a low heat again. Keep stirring the sauce every 3-5 minutes so that it doesn’t stick to the bottom of the pan, cook for a further 15-20 minutes. Once your tomatoes are soft place into a liquidiser in batches and blend until smooth. After blending all of the sauce add the sugar, basil and tomato vines. Stir through the sauce and cover it with cling film, leaving it to infuse until building the ratatouille. Preheat the oven to 200C and place the griddle pan on a high heat. Remove the tops from the aubergines and cut lengthways slices as thick as your little finger, drizzle with the rapeseed oil and a small pinch of salt per slice and griddle on both sides just until marked. Peel both colours of peppers, cut the bottom of them off just enough so that they stand up on the board and cut the sides off so that you have four or five pieces per pepper. Then slice the courgette into rounds as thick as a pencil. You can use a mandolin to do this as they do in Ratatouille, but a sharp knife works just as well. Coat the base and sides of the dish with a little oil and sprinkle with a pinch of salt and a grind of black pepper, then layer the courgettes into the dish, with an overlap. Remove the basil and the tomato vines from the sauce and spoon over just enough sauce to cover the courgettes. Add a layer of one colour of the peppers, season again and add another thin layer of the sauce. Repeat this process layering all of the vegetable and sauce until you have filled the dish. Cover the vegetables with a sheet of the grease proof paper and place into the oven, cook until you can place a knife easily through the vegetable with no resistance. Remove the grease proof paper and allow to cool for ten minutes or so, then serve. This may be a peasant dish but it’s really tasty. Perfect on its own, or served with some barbecued lamb chops.